Rotate or Flip Data for Excel is designed to simplify and accelerate the transformation of tabular data in Excel via transposition. 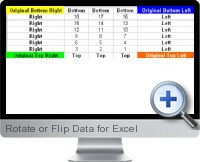 The Excel add-in is ideal for quickly rotating data and flipping the order of rows or columns in any direction. Reverse selected cells from left to right or right to left. Transpose selected cells from row to column or column to row. Rotate selected range clockwise or counter clockwise. Supports reverse text direction and merged cell formats. Manual copy and paste is not required.